The democratization process that began after Prime Minister Abiy Ahmed took office in Ethiopia one year ago will run aground unless its citizens become increasingly rooted in inclusive civil society institutions, like trade unions, that are capable of overcoming deeply entrenched ethnic, cultural and geographic divisions, said Confederation of Ethiopian Trade Unions (CETU) President Kassahun Follo today in Washington, D.C. Indeed, Ethiopia’s workers are already connected across regional and ethnic lines due to CETU’s countrywide reach and its inclusive approach to membership and worker rights. 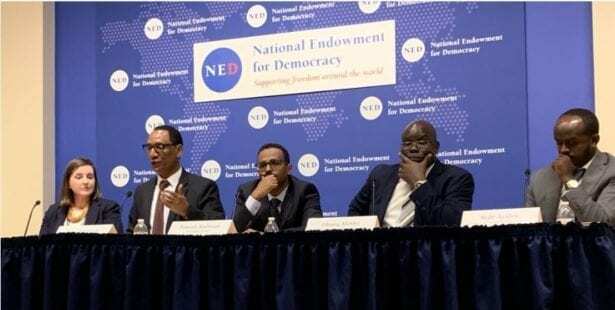 Follo, speaking at a National Endowment for Democracy (NED) panel discussion titled, “Ethiopia’s Democratic Opening One Year Later: Looking Back and Looking Ahead,” said organizations promoting inclusivity are crucial in a country where citizens from 80 ethnic groups are represented by more than 100 ethnically and regionally based political parties. Taking advantage of an administrative structure that covers all nine regions of the country, CETU is uniquely positioned to take the democratization process beyond the capital, Addis Ababa, into lower levels of government across the country. “Change at the top is not enough,” said Follo. CETU is Ethiopia’s largest multi-ethnic civil society organization, representing about 570,000 workers organized into nine affiliated industrial federations and approximately 1,700 trade unions. The federation, with Solidarity Center support, is striving to improve its member outreach programs through regional centers—in part to continue organizing in construction, agriculture and textiles sectors—but also to ensure that worker interests and recommendations are adequately represented to officials at all levels of government as the political and economic reform process moves forward. Ethiopia has been one of the African continent’s best economic performers, growing at a rate of 10 percent for the past 15 years under state-directed development by a government that permitted no political opposition, but invested heavily in infrastructure, agriculture, education and other sectors. Although Ethiopia is the fastest growing economy in the region, it is also one of the poorest, with a per capita income of $783. The country needs an economic transformation that parallels its political transformation, said Follo. Workers in Ethiopia’s industrial parks—established by government to encourage foreign direct investment (FDI)—earn poverty wages of less than $30 per month. CETU is therefore advocating with government and employers for any new labor law to include an adequate minimum wage. “Otherwise, how can [workers] eat?” Follo asked.